This week’s guest bloggers are Denise and Marc Dragiewicz, co-directors of an upcoming film on deforestation in the Andasibe region of Madagascar, and efforts locals are taking to preserve the lemurs and rebuild the forests. In this blog, Denise and Marc give us a glimpse at their inspiration for making the film, and what they learned about the conservation challenges that face the people and animals of Madagascar. Madagascar’s ecosystem is one of the most threatened on the planet. 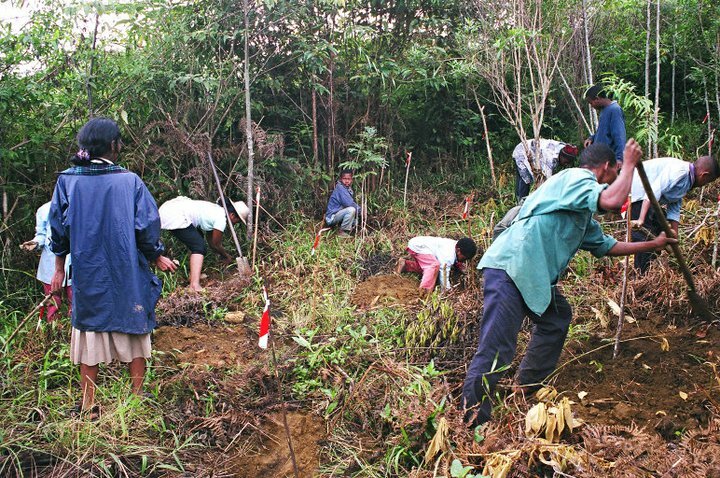 A nation comprised of subsistence farmers, most Malagasy people do not have the luxury to see beyond their daily needs to consider the long-term consequences of deforestation. Nevertheless, there is an air of optimism in the small village of Andasibe. The film follows the grassroots efforts of community members galvanized to save not only their landscape, but also their longevity as a community. Their solution? Turning much of the remaining forest into a park, to both embolden locals to protect it and to spur financially supportive tourism from outsiders. Andasibe focuses on the efforts of two dedicated individuals and one organization: NIRINA, a fifty-nine-year-old guide who regales folklore of the natural world, solicits men to stand guard around a remaining fragment of native forest; CLAUDE runs workshops on sustainable practices, unionizes women craft-makers, and trains young people as nature guides; MITSINJO, a grassroots organization, is determined to protect the natural habitat where lemurs dwell. Through primary school workshops, they teach empathy between native children and the animals that live along side them – thus empowering children as the crucial next generation to carry on the efforts of change. Working against these efforts is the mindset of the everyday community members struggling to survive, continuing to practice slash and burn agriculture, making charcoal out of native trees, and engaging in illegal sales of rare hardwoods. Uniting the film is commentary from renowned scientists, American sociology and anthropology professors, a British botanist, and a climate expert. Viewers also hear from Malagasy local residents about the dire need to support their families and the effect that regulation has had on their ability to feed themselves. A tension thus is revealed between past and present, and the long term needs of the community vs. the very real present day needs of those individuals living in it. The beautiful yet eerie call of indri lemurs staking claims in their territory permeates Andasibe at certain times of the day. Walking in the local forests, we witness natural scenery come to life in a way few are familiar with. Primates jump from branch to branch above our heads. Enormous lunar moths, in an array of rainbow colors, lay gingerly against the bark of patient trees. Chameleons creep slowly along the vegetation. The lush canopy of the woods keeps the air cool and damp. Serenity and balance mollify all who wonder. The striking natural beauty Madagascar evokes abounds. After half a day of bus rides through the cultivated countryside of Madagascar, the initial observations of Andasibe’s forests were overwhelming. During the first hour of our visit, from the restaurant of our hotel, we watched wild sifaka lemurs hanging on the distant trees, and, soon afterwards, we could hear the calls of local indris echoing through the landscape. Two of the largest extant lemurs, witnessing these rare animals on the edge of human settlement was a definite sign something unique was occurring in the community. As a new couple, my husband Marc and I planned a six-month honeymoon to Africa to commence a desire for making environmental documentaries. It was a marriage of a filmmaker, writer, and literature professor and a background in biology, tropically ecology, and wildlife conservation. When choosing places to visit, Madagascar was on top of the list and a dream come true for the both of us. While researching potential destinations, Andasibe emerged as a place of well-protected national parks with complementary forests cared for by local community members. After meeting some of the local guides at our hotel and stepping into the forest the following morning, we were confident the story of Andasibe was something worth documenting, a chance to shine light on some unusual success stories in a country facing unfathomable environmental challenges. The forest that remains in Madagascar houses thousands of endemic species from lemurs to baobabs to leaf tail geckos. By drawing attention to the needs of this unique environment, it is possible to illustrate how the disruption of a fragile ecosystem can lead to catastrophic consequences not only for people inhabiting the land but for global weather patterns as well. The motivation behind this project is to reach global audiences that have a concern about– and seek innovative solutions to– environmental problems in developing countries. We envision this film as a tool for nonprofit organizations, educational institutions, and policy bodies to expand the conversation around deforestation and climate change. We intend on partnering across sectors to reach as large an audience as possible during our post-production cycle by releasing ancillary clips exclusively in conjunction with organizations like the Sierra Club and Greenpeace. We have a tremendous opportunity to begin an audience engagement campaign as part of the global Earth Day campaigns sponsored on social media sites by both charities and corporate partners. Communities like Andasibe are crucial to the future of conservation. We hope to bring attention to them, to encourage them, and to support them. As a biologist, Marc has been travelling to tropical forests and conservation areas for more than twenty-five years–not very long in ecological time, yet humans have altered the environment more during that time than any quarter century in history. He has personally seen immeasurable tracts of forest disappear in the Ecuadorian Amazon, Peninsular Malaysia, and Borneo. But still he was surprised to witness the myriad regions of empty hills recently cleared in Madagascar. On the filmmaking side, I have been working tirelessly to earn post-production funding for the film as well as to find distribution outlets for the finished product. Although I have been able to secure a portion of finishing funds to unite the documentary, it has proven very difficult to raise adequate money for the project. A major problem, most likely, is the inability to relate, for most people, to a country they know very little about. 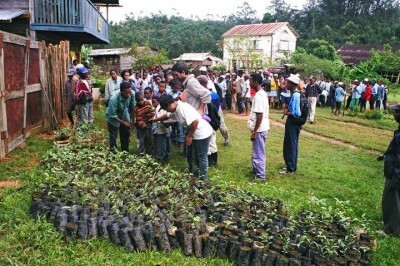 It is difficult to trigger enthusiasm for a landscape, and the people who inhabit it, when those entities are so far removed from the everyday life in nations where people are in the position to help, not only in the funding of the film, but also in the cause overall, to think deeply about how to help Madagascar as a nation move progressively into a future where dependence on natural resources is not the general way of managing survival. With this in mind, I knew a portion of the film should illustrate how the disruption of this fragile ecosystem is contributing to climate change. I commissioned the help of Hal Needham from Louisiana State University to show the connection between deforestation in Madagascar and its influence on global weather patterns. This, I hoped, would exemplify to the general public the need to be proactive about environmental problems occurring in nations other than our own. The development of this documentary was sparked entirely from spontaneous enthusiasm for the people of Andasibe and their dedication to protecting the remaining forests in their community. We did not enter into this project with an outline that would lead our investigations into a general direction. Our goals developed as we awoke each morning and made plans to meet with people from the local community – village elders, leaders of conservation groups, land owners who lived in remote areas – learning from these discussions how deforestation, as well as government regulation in some regions, was affecting the everyday lifestyle of Andasibe residents. The greatest challenge may have been deciding on what to focus on during our limited time in the region. The time of our visit was right before the Christmas holidays, which proved to be a great advantage because there had been many outside researchers there for an annual conference (many who we interviewed about scientific and governmental issues), but it also meant that our time was extremely limited as many of the locals would be leaving for holiday trips. With such a rapidly growing population still practicing subsistence agriculture, there is tremendous pressure on the remaining pockets of Madagascar’s forests. The country is still recovering from the 2009 political coup, which brought to a standstill funding from the international community, funding which was used for services such as family planning and agricultural training. Without a national initiative to push forward contemporary methods of agriculture and a strong desire from the current political system to curb the modern population explosion, the country has little hope. During filming, many natives commented on the elongated dry seasons and unprecedented cyclones they had been experiencing. In addition, in recent years, the country has experienced frequent problems with its inability to grow enough food for its population, needing the assistance of international relief agencies to donate food for the masses. Yet, the deforestation continues. The challenge is to turn the tide on human pressures to the environment. In the twenty-first century, it just isn’t practical for a small community to clear an entire hillside to feed themselves without the ability to limit their offspring. There is no longer an ample supply of forestland for subsequent generations and recently burned fields no longer have ample time to become productive again. Nowadays, there are technologies for faming that do not require such unsustainable uses of land, and these must become the new norm. A great example of this would be SRI, or the System of Rice Intensification, that was actually developed by a Malagasy monk and taught to international scholars as they were doing research in the country. SRI is a combination of innovative agricultural practices aimed at increasing the yield of rice produced in farming and has had many successes in rural farming communities throughout the world. Rice paddies have also been adopted in many communities as a sustainable method of growing rice, which is the food staple of the country. It seems logical for methods such as these, which have proven fruitful, to now take precedence over outdated farming habits. But these habits have been so long ingrained in the culture, they take on a spiritual aspect as well, wherein ancestral devotion is evoked during the practice of preparing the land, making many Malagasy people even more resistant to change. Another way of encouraging local communities to protect their natural resources has been the financial rewards that come from tourism. Natural guiding pays the salary of many young men, and sometimes women, who live along the peripheries of national or even community maintained parks. And many women in these communities who formerly relied on using their natural resources, such as burning native trees for charcoal production, can now make a living (at least during tourism’s high season) through manufacturing crafts such as embroidered patches, t-shirts, and dresses, and selling these crafts in tourist areas. The women interviewed in our film very much enjoyed this modern form of employment and were eager to learn the skills to make them more efficient at craft-making. The problem here—the influx of tourism is not maintained at a steady rate throughout the year, and many women are forced to go back to taking from the forests during the lull of foreign interest. Claude, one of the men interviewed throughout the film, is trying to unionize Andasibe craft women so that they can more efficiently earn, spend, and save the money made during these periods. Lastly, we need to explore ways that re-growing and maintaining native vegetation can benefit local communities. Tourism is a great motivation, but other incentives are emerging such as rewarding landowners for participating in carbon sequestration programs. Early in the film, we meet Nirina, a nature guide, who draws us into his passion to save a fragment of native forest, as we are introduced to the guards he has standing around its boundaries. He has dedicated his life to protecting this area by fashioning it into a park and teaching the people in his community that they can reap economic benefits from the land that do not involve taking from it in a detrimental way. The greatest obstacle to these efforts is the inability of the people to see benefits in alternative livelihoods. Not only do they continue to destroy large segments of land practicing slash and burn agriculture, they engage in illegal timber sales of rare hardwoods such as rosewood, which takes over a hundred years to mature. Also standing in the way is a government that does little to advance more sustainable agricultural practices. Nirina believes if remaining patches of forest can be turned into parks, communities will have an incentive to protect the environment, reaping financial benefits from the preserved land via tourism. Claude, a rice farmer, has recognized the influence of deforestation on his community: “There are a lot of impacts. We don’t have enough wood, and there has been a climate change.” As a result, he is teaching his community about sustainable practices, encouraging rice paddies as an alternative to producing hill rice via slash and burn agriculture. Like Nirina, he shrewdly understands the benefits of outside money and has formed the local Sahi Association with the goal of maintaining a patch of native forest. In this way, he is able to invite tourism to this privately owned land to provide additional economic opportunities. He has solicited female trainers to educate women’s groups in craft manufacturing, such as basket weaving and bead-making, using sustainable resources, so that they are able to make an income selling crafts to tourists. Nevertheless, in order to sustain this type of growth, he knows there must be a steady influx of tourism. He remarks with apprehension, “From November to April, women are forced to go to the forest to make charcoal in order to feed their families,” as currently they have no alternative methods of sustaining themselves during these periods of declined tourism. The largest of remaining lemurs, rapid deforestation and habitat loss threaten the indri with extinction. It is the goal of yet another grassroots organization, Mitsinjo, to protect the land in which these animals live. Establishing tree nurseries, which have restored more than a thousand hectares of rainforest, and operating community outreach programs, their goals are to attract local people to assist in conservation activities and to teach children about the value of biodiversity. Additionally, Mitsinjo, meaning in Malagasy, “To look to the future,” has been able to solicit foreign aid to facilitate scientific research to preserve their privately owned forests and the species that inhabit them. 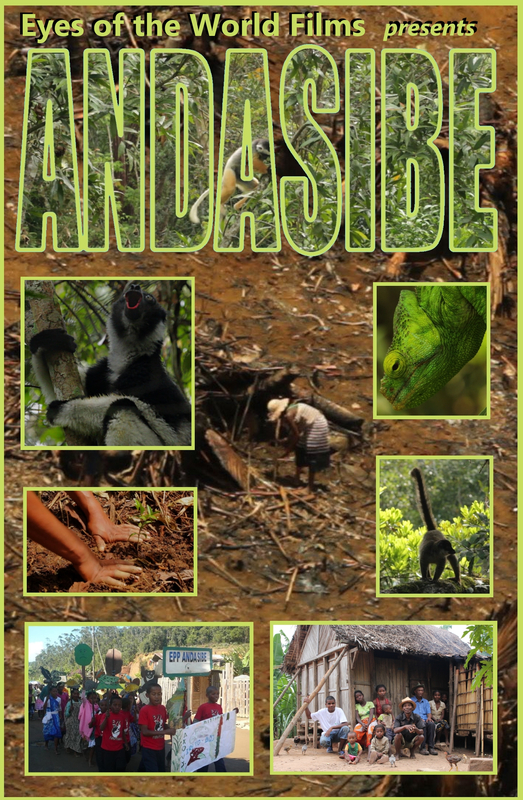 They have been successful in engaging the help of international NGOs to initiate the first modern research station in Andasibe, with branches now spreading to other areas of Madagascar and drawing well-established European researchers to train locals. The people working in Andasibe are a great model of what community conservation efforts can do to turn around destructive habits. In Andasibe, the essential part of the equation is the passion of the people to protect and revitalize what is left of their natural areas, to help build a future where natural lands are respected and where there might be additional economic opportunities without a definite need to rely on the forest for sustenance. 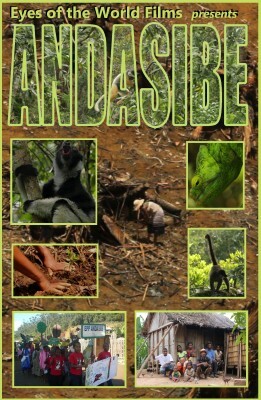 If you are interested in directly supporting conservation efforts in Andasibe, we can vouch for donations given directly to Association Mitsinjo: http://www.amphibianark.org/donation-for-mitsinjo-project/. Please tell them that their friends at Eyes of the World Films sent you. We would consider a donation to them as a success for our film (or you could give to both of us to help us get the word out on other important organizations).